Subject: Lissabon: Sociedade Typograhpica Franco-Portugueza. 12mo: 382, [iv] pp. Half leather. Contemporary half leather over boards. 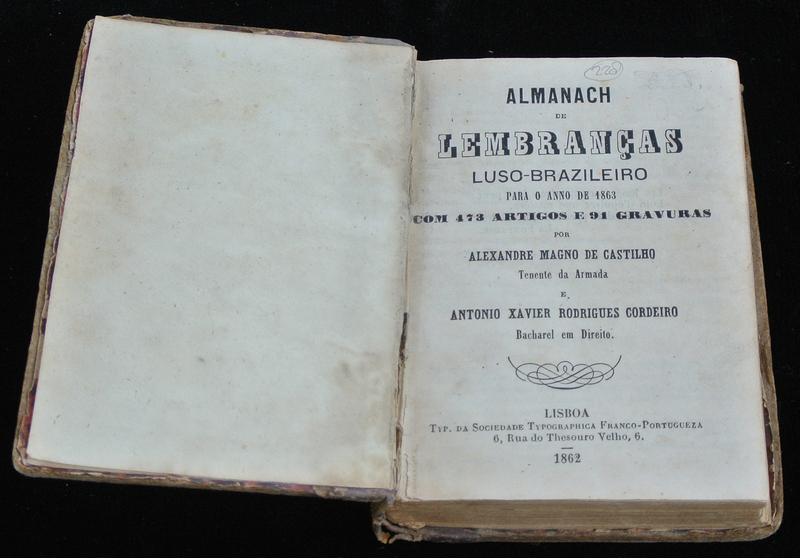 The Almanach de Lembrancas, first published in 1851, was founded by Alexandre de Castilho. Rodrigues Cordeiro joined in 1861, and took over publication in 1872, after Castilho's death. 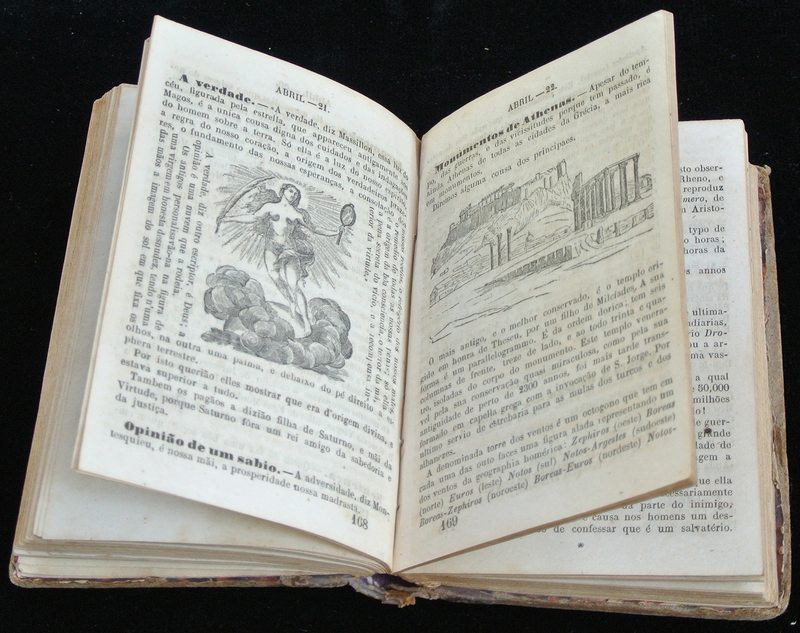 After Rodrigues Cordeiro's death the Novo almanach was continued by his nephew and then his nephew's son, until at least 1920. Condition: Very good, given age. The boards bare. Tail of the spine damaged. Internally sound and clean, with some pages cut quite short (with minimal loss of text). Whether this was done by the printer or a later binder is unknown. Medium: 91 wood engraved illustrations in the text. Size (in cm): 12mo: 8.9 x 13.1 cm. Size (in inch): 12mo: 3.51 x 5.16 inch. 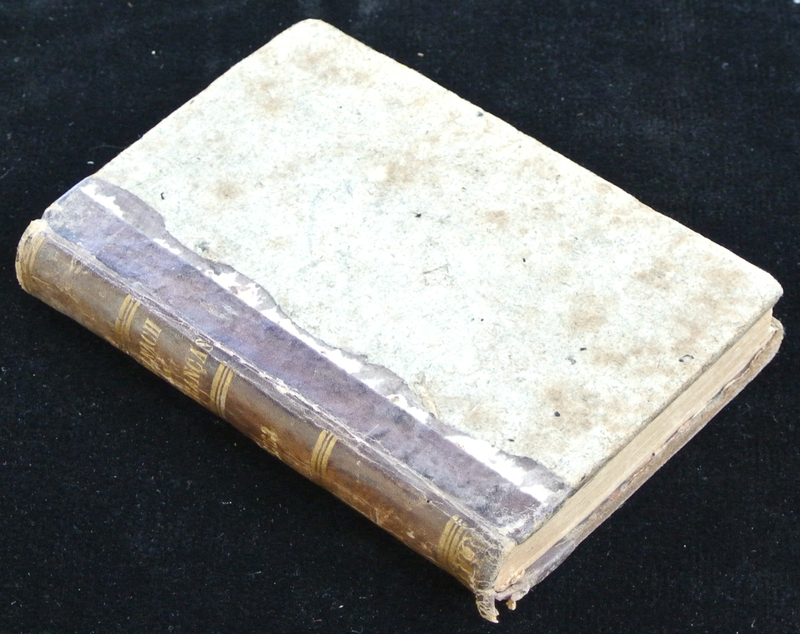 Antique Book, titled: 'Almanach de Lembrancas Luso-Brazileiro para o anno de 1863. ', by: Alexandre Magno de Castilho & Antonio Xavier Rodrigues Cordeiro. Illustrated Almanac for Portuguese-speaking Brasil. Artists and Engravers: Author(s): Alexandre Magno de Castilho & Antonio Xavier Rodrigues Cordeiro.